News on the grapevine is filtering down for Bay Trail-D. We have had the 20W Avoton server equivalent processor in our offices for a little while now, but alongside this Intel have 10W consumer based Celerons to market. With the chips being a ball-grid-array arrangement it is up to the motherboard manufacturers to provide the base on which these processors sit. Alongside some display from MSI at CES, GIGABYTE and Biostar are coming to market with their versions. 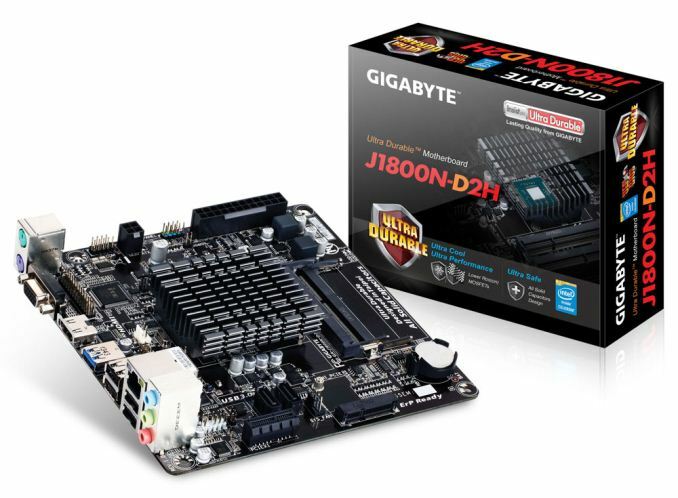 From GIGABYTE, this is the J1800N-D2H, using the 10W Intel Celeron J1800 Bay Trail-D SoC, a dual core Silvermont CPU starting at 2.41 GHz with turbo up to 2.58 GHz. 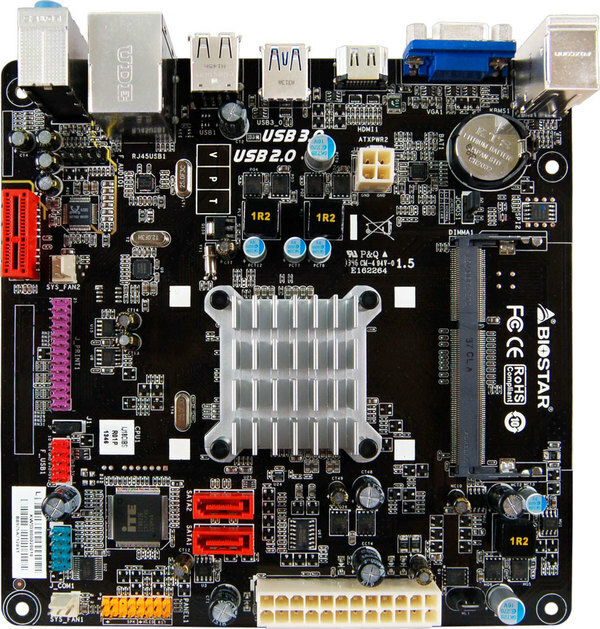 N in the name indicates mini-ITX, and D2H positions the motherboard at the lower end in terms of specifications. 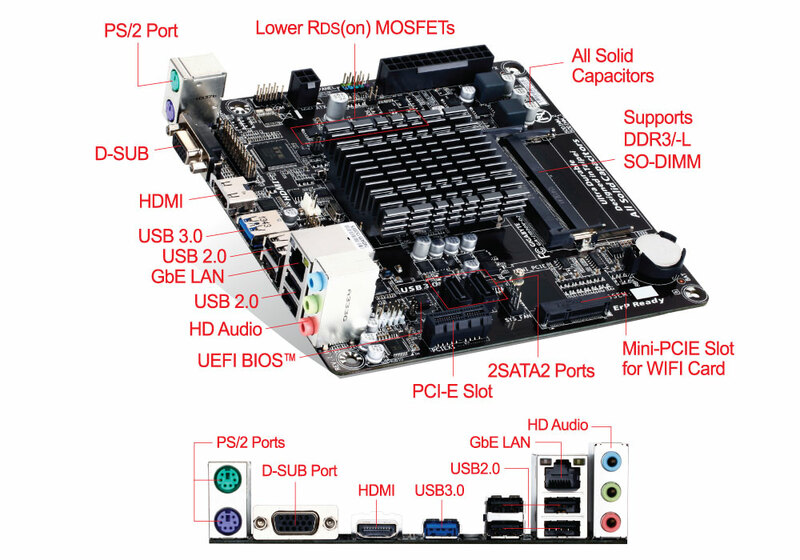 The board itself uses a passive heatsink to cool the CPU (more than understandable for 10W), two DDR3L SO-DIMM 1333 MHz slots (1.35V memory only), a D-sub and HDMI audio output, two PS/2 ports, USB 3.0, a USB 2.0 hub, two SATA 3 Gbps ports, a PCIe 2.0 x1 slot, a mini-PCIe slot, Realtek ALC887 audio and Realtek NIC, all in a 17cm square form factor. 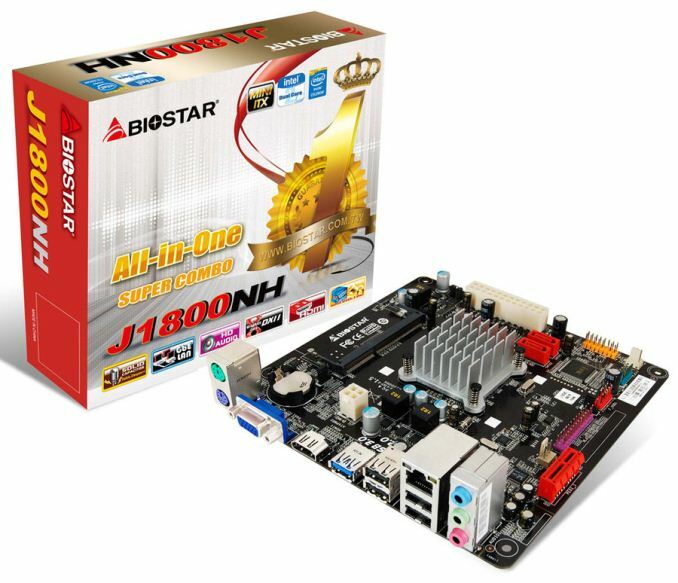 The Biostar J1800NH is a similar product with the Celeron J1800 SoC, using instead a single DDR3L SO-DIMM slot, fewer USB 2.0 ports and a Realtek ALC662 audio codec instead. What is perhaps more surprising is the pricing. The Biostar motherboard is currently available for $56 with a $60 MSRP – the GIGABYTE motherboard, and the MSI one at CES, should be around $60 as well. However this SoC, sold by Intel, is listed as $72 tray price (i.e. in batches of 1000). This means either that these manufacturers are getting them at a discount, or selling them at a loss. The purpose for Bay Trail-D is tablet like performance in a desktop form factor, with perhaps the added advantage of expandability and connectors. Users wanting quad core solutions will have to keep eyes peeled for J1850/J1900 versions, or jump to Pentium J2850/J2900. We saw that ECS was going to release a line of these motherboards last year. As mentioned, we have Avoton in to test, specifically Intel’s 8-core Silvermont solution for IPC/servers. Keep your eyes peeled for that review. Sources: Fanless Tech via Liliputing via Tech Report. Rather get a PCIe x1 extender and cut the end off that, that way you don't void the warranty on the board. I think atom still has SIMD, just not as wide and capable as those of the desktop and laptop cores, but that's the price you pay for better power efficiency. Something comparable to the previous (current market) generation of NEON. "Intel is not saying precisely what processor socket the future Knights Landing chip will slip into, but the most obvious one is the socket shared by the Xeon E5 of the time. All that Hazra would confirm was that the idea is to deploy 14-nanometer processes to cram more transistors onto the Knights Landing chip and to get around some of the bottlenecks with the PCI-Express 3.0 bus that current coprocessors of any kind are adversely affected by." "He would not discuss if memory for the future Xeon Phi would link in over the QuickPath Interconnect or by some other means, but he did say that Intel would be stacking the memory onto the processor package and that Knights Landing would have "leadership compute and memory bandwidth".